In which I tell you how to keep your Transcripts and Dictionary folders free of unwanted transcript, audio, and dictionary files. So. You've got digitalCAT (DC for short) installed, and everything works. You've finished your first practice session, and exited DC. An hour later (because you are a dedicated student), you want to practice again. You start up digitalCAT, and accept the file name offered, and start practicing. A few minutes later, you had a message pop up about audio settings. You dismiss this, as you aren't using AudioSync, because you're just practicing. You finish your session without incident, and exit the application. Another day, another practice session: digitalCAT gives you another file name, which you dutifully accept, you practice a bit, dismiss the popup about AudioSynch, practice some more, and end your session. Another hour, another practice session (because you're a dedicated student, remember?). Another title, which you dutifully accept. Another AudioSynch popup, which you dismiss. Fast forward a month. For some reason, you have to look inside your Transcripts folder ... and when you do, you are *shocked* when you see about 600 files in there --! You gasp. Your heart begins to beat faster. "What is all this?!" you ask yourself. "Do I need any of this stuff?" The answer: Unless it's a test you haven't typed up, probably not. Delete it all, and worry not. You do so ... "But," you wonder, "how do I avoid having this happen again next month?" I have my copy of digitalCAT set up so that when I double-click a shortcut on my desktop, a blank file opens, I select 'Start Realtime Session' from the Translation menu, and I start practicing. I do not get any questions about AudioSync, nor do I get any offers to use a default title. This article will show you how to set up your copy of digitalCAT the same way. First, open your Transcripts folder. If you don't know, it's located in C:\PROGRAMS\DIGITALCAT\TRANSCRIPTS C:\PROGRAMS\STENOVATIONS\DIGITALCAT\TRANSCRIPTS. Take a look around in there. If you've never stroked WORD ONE in digitalCAT, this folder will be empty. If you've done a few practice sessions as described earlier, it's probably full. If you're a working reporter, it's probably full ... but you need those files. Your Include files are also kept in here, and you'll need those as well. Ask yourself: "Do I need any of these files?" If not, throw them away. Those of you who have read my "Fear Computers No More" piece know to press CNTRL-A to select everything, and right-click a file and select Delete. If you don't know that (or find yourself dragging each file to the recycle bin, one by one), you might want to brush up on your keyboard commands sometime. Okay, so you've tossed the files, and your Transcripts folder is empty. Now the work begins. 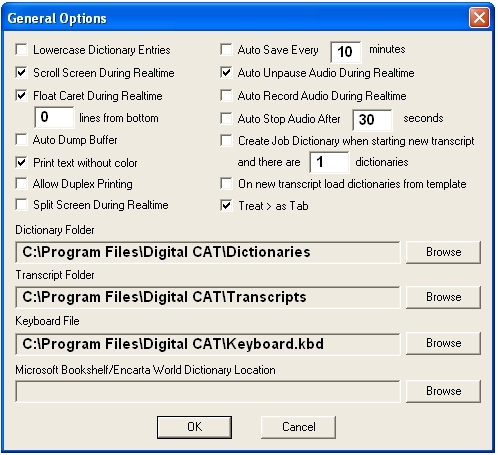 Open digitalCAT's Translation Editor. Start a Realtime session. When it offers you a title, give it a unique (and easy) name, like, say, MyPractice (though I'm using the name glen_kicks_steno_butt, but that's just me), and hit Okay. Open to the General Options window (Options --> General). This will open a window with a bunch of different options. Not to worry -- we'll only be dealing with two. First, uncheck the box that says 'Auto Save Every 10 minutes.' This step is key to my file management method. Next, uncheck the 'Auto Record Audio During Realtime' box. Uncheck "Create Job Dictionary When Starting New Transcript." Next, exit DC. When asked if you want to save the file, click Okay. Now open your Transcripts folder. Inside you may see a couple of new files: a MyFractice.trn file, and a MyPractice.bak file. You may also only see the MyPractice.trn file. Like the ads say, "Your mileage may vary." Right-click (once) on the MyPractice.trn file, and drag it to your desktop. A little menu will pop up, asking you if you want to move the file, copy it, or make a shortcut. Close the Transcripts folder, and double-click that shortcut you just made, and start a realtime session. Did you notice anything? If not, I'll tell you what you should have noticed: No questions about files, no questions about Audio Sync, no questions about job dictionaries ... in fact, it just worked. When you're done practicing, end your realtime session (gotta know those stats, right?) and exit DC. When it asks if you want to save, do as Nancy Reagan used to say and just say No. Now it is ready for your next realtime session. "Wow, that's cool! But what if I want to save my session?" That's easy: Go to File, select Save As, and give it a new name. Best of all, it will not harm your MyPractice file at all. "My computer went to sleep, and everything was saved! What do I do now?" This one is fairly easy ... just start a new session, and save it with the same name as your original file (MyPractice, remember?). You will be asked if you want to replace the existing file, which, of course, you do, so click Yes, or Okay, or whatever will make the dialog box go away, and you're back in business. Now go practice; you know you want to.